It was an ordinary dark winter morning, and snow was still falling. No window in the village showed a light. Katri screened the lamp so she wouldn't wake her brother while she made coffed and put the Thermos beside his bed. The room was very cold. The big dog lay the door and looked at her with his nose between his paws, waiting for her to take him out. I have mentioned before a love of Tove Jansson whilst growing up. I was introduced quite early on the Moomins and loved them. However, it wasn't until reading Nymeth's review of The Summer Book, that I realised Jansson had written adult books too. Only a few of them have been translated into English, but after reading this one, I intend to get hold of all of them. The story is set during the deep winter snows of Sweden, in a hamlet, where a strange, cold young woman, mechanically works on an elderly artist in order to persuade her that she needs someone to live with her. After faking a break-in at the house, Katris and her brother Mats, who the townfolk considered to be rather simple, move in with the old lady to help her run the house. As the story progresses, you become unsure as to who is deceiving whom. The old lady, Anna lies to Katri just as much as Katri lies to her. By the end, Katri cannot cope with the lies anymore and begins to tell the truth. As you read the book, you watch the two women, battling each other with a mixture of truths and lies as they try to take the higher ground. By the time spring arrives, thawing the winter snows and inner bitterness, both characters have changed. As to whether they have changed for the better, I find I am still undecided. This is a book full of subtlety, from the subtle changes to the weather as the winter season builds up to a crescendo, then slowly dies out, to the subtle changes in the personality of the characters as their living arrangements change. I loved this book, especially as I began to read this during our first snow fall before Christmas. I was all wrapped up with my blanket, hot water bottle and Lemsip (for my cold) and became totally immersed in the white world created by Jansson, whilst watching our own skyline become a winter wonderland. There were a few spelling mistakes within the book and I felt that the translation should have been checked a bit more thoroughly, as certain words were not grammatically correct. Now I am no grammar queen, but when it is entirely obvious to me that the word is not written correctly, then there are obviously problems, as usually I don't notice things like that. The book is introduced by Ali Smith and I found the forward to be very interesting. Smith mentioned that the book had been considered autobiographical in parts,which Jansson never denied. The character of Anna spends a lot of time in the book struggling to cope with the trappings of fame. She cannot cope with the fan mail that she receives as well as the demands for her character to be used in advertising. You begin to wonder then if Jansson struggled with these things too. Katri is an interesting character; she is hated by the townsfolk, yet they all go to her to sort out any mathematical problems or legal issues they may have. They are almost frightened by her honesty and her brashness. The children of the town call her a witch as she strides past them with her rather menacing dog. Katri ignores the way the townsfolk treat her; she is very calculated and keeps her mind on her grand plans. On the whole, I really enjoyed this book. Jansson's descriptive prose swept me away and I managed to read the book in one sitting. 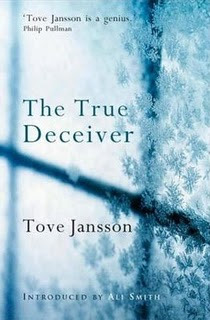 I would definitely recommend it and I will be on the look out for other books written by Tove Jansson. Anyway, yay Tove, and I have still not read a single book by her, shame on me! Spelling mistakes aside, does it translate well? Not so long ago I read a book translated from German into English and some of the words they used we just wouldn't use or at least not in that combination. The Mommins - now there's a trip down memory lane. Sounds like another good one. I have never heard of this author before but I like the way this one seems it should be rich in emotional complexity, which of course I love. Good luck in collecting the rest of them. I would be hooked just trying to figure out what the truth was. I love the cover too. That was a very compelling first paragraph, and now I'm quite intrigued by your description of the story. Set in Sweden also fascinates me, as my maternal grandparents were born and grew up there. My grandmother had intriguing stories! I haven't even HEARD of this author. Sheesh. When I think about all the amazing books in OTHER LANGUAGES I haven't read yet, I get a headache. Glad these are being translated! Books where everyone lies to each other definitely make for interesting reads. I haven't heard of this author before. I'm glad you enjoyed the book in spite of the errors. Thanks for your review about this book! I haven't heard of this author, so I'll check it out soon! I've never heard of this one before, but I TOTALLY want to read it now! Ooh! I've never read anything set in Sweden before. this sounds really good. its great when you can emerse yourself in a book. This sounds absolutely wonderful! Must read more Tove Jansson.